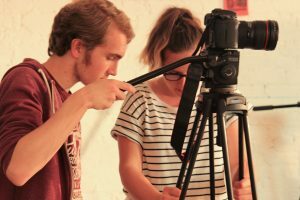 Signal was commissioned by Get it Loud in Libraries to train two film and media students, from Blackburn, the skills involved in interviewing for flim. The gig was in the amazing Liverpool Library. Over the last 9 years the Get It Loud In Libraries live programme has drawn an audience of over 28,000 people into libraries across the UK. Through live music, it has created exciting opportunities for young people to lead, participate, volunteer and excel in artistic and cultural activity. They allow people to build a career CV whilst having fun with friends. We were excited to interview Frank Turner along with the young filmmakers who loved every minute of the workshop.